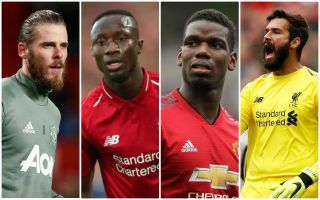 The Manchester United and Liverpool rivalry looks as intense as ever this season as it’s widely viewed that after years of Mancunian dominance, it’s the Merseyside giants who are now on the up under Jurgen Klopp. Although United finished above their rivals in the Premier League last season, there was only six points in it in the end, while Jose Mourinho’s side finished a whopping 19 points behind runaway champions Manchester City. Liverpool, of course, also reached the Champions League final and were unlucky to lose to Real Madrid after a thrilling European campaign that saw them blow apart City, Porto and Roma on their way to the final in Kiev. Since then, Klopp has had a superb transfer window, adding Alisson, Naby Keita, Fabinho and Xherdan Shaqiri to his squad, while this disjointed United outfit have really only brought in Fred as a player likely to be a regular in their first-team. So how good are Liverpool? Ex-Red Dean Saunders yesterday suggested to talkSPORT that none of this current United XI would get in the Liverpool side. So, starting in goal, we’re sorry but it’s a no-brainer in terms of David de Gea over Alisson. One has consistently been probably the best goalkeeper on the planet for the last five years, while the other has been in the Premier League for five minutes. He’s an exciting signing, but get some perspective, Liverpool fans. In defence, some people might not agree with this, but Eric Bailly looks a real player when he’s fit and confident. In a better side than this United one, the Ivorian would surely be among the best centre-backs in Europe, but as it is he’s already a superior option to Dejan Lovren or Joe Gomez, let’s be honest. Liverpool dominate the rest of that defence, with Virgil van Dijk superb since he joined from Southampton, and full-backs Trent Alexander-Arnold and Andrew Robertson two of the biggest surprise success stories of last season. In what would be a dream midfield partnership (if they were both playing under Klopp, that is) we’ve gone for Naby Keita and Paul Pogba as our central pairing. The Red Devils man has undoubtedly struggled under Mourinho, but just look at how good he was when unleashed for France this summer. Keita also looks an immense signing and the thought of those two together is almost spine-tingling. Who's got the better squad? In the attacking midfield three, we of course go for Mohamed Salah and Sadio Mane – two superbly in-form attackers who were instrumental to LFC’s success last season, but there’s also room for United’s Alexis Sanchez in this 4-2-3-1 formation. The Chilean has of course struggled since leaving Arsenal for United, but on his day he’s one of the best in the world and, again, if he were alongside this lot and playing under Klopp at Liverpool we’d see a very different player. Finally, this was a close call, but we went for Roberto Firmino over Romelu Lukaku to lead the line. Both are very different players, so it’s hard to compare, but the Brazil international’s work rate and improved scoring record in recent times just gives him the edge over Lukaku, who has the tendency to disappear on occasion, particularly in the big games. So there you have it…no United players in this Liverpool team? Not quite, though it’s undoubtedly the Merseysiders who have the edge at the moment.